High Tech High in Chula Vista is a charter school that takes learning to new lengths and fuses project based learning with real cooperative community experiences.. This type of learning gives kids the opportunity to have an effect on their communities and families outside of the classroom. 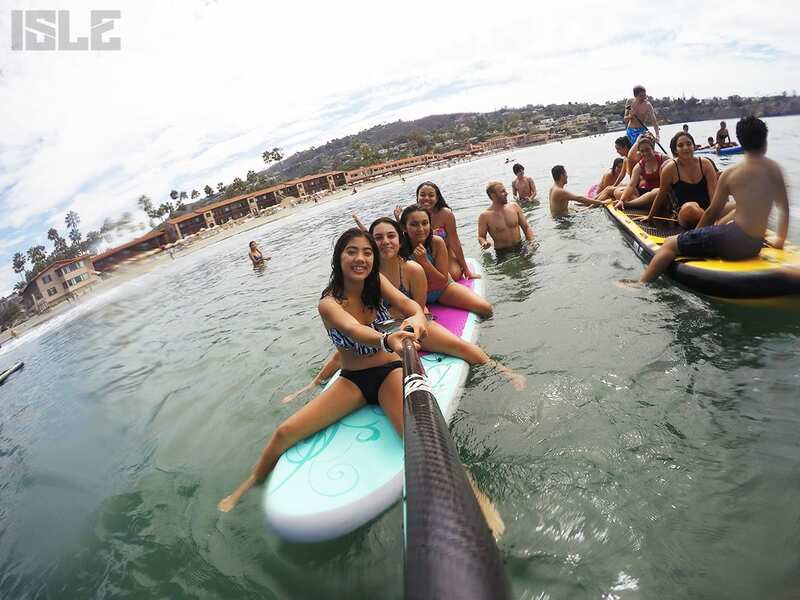 We were contacted by High Tech High to see if we could bring our paddle boards down to La Jolla Shores and teach the kids to SUP and explain why standup paddle boarding is good for ecotourism. We obliged and had a different type of board meeting! Ecotourism by definition is, “Responsible travel to natural areas that conserve the environment and improves the well-being of the local people.” By that interpretation it seems fitting that we meet at the La Jolla Shores which is a Marine Protected Area because of the current existing marine habitat by the cliffs. With San Diego’s coastal vicinity and easy access to the Pacific Ocean it offers the perfect opportunity for ecotourism. The kids split into two groups; one group went snorkeling by the cliffs while the other half of the group was given a talk about how standup paddle boarding are advantageous for ecotourism. We spoke about how SUPs don’t emit any harmful toxins like watercrafts do; furthermore the vantage point of a SUP is unrivaled compared to a kayak which you’re sitting or a boat where you can’t venture close to shallow areas. Isle Surf and SUP is all about supporting conservation and research which is why we sponsor a local PhD student, Phil Bresnahan who has turned his Isle paddle board into a research tool and is now SUPing for Science. Phil uses the paddleboards to make chemical measurements that help him understand the oceans health. He invented a cutting-edge pH sensors that measures ocean acidity. He uses this sensor to collect data on levels of ocean acidity very close to shore and in fragile ecosystems where larger research vessels can’t go or access. We knew there would be a lot of kids and to accommodate all of them we brought our supersized SUP, the Megalodon. What was meant for a group paddle turned into everyone getting on the Megalodon to see if it sinks…? It did not! Although not everyone stood up and paddled they did however enjoy what paddle boards were meant for – Getting out in the water and having fun! “I had so much with them! Even though I fell off twice, that just added to the fun! I learned a lot about how to steer a board, just by experience. The best part was trying to keep my balance.” – Dylan f.
At the end of the day everyone had an amazing time and we all taught one another something. The students learned about standup paddle boarding and how SUPs can be beneficial for ecotourism while we walked away learning you can definitely fit more than 6 people on the Megalodon!